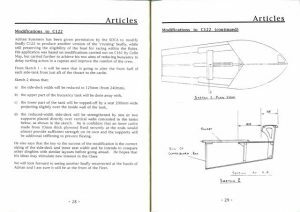 During the 1980’s very few Seaflys were being built and the Seafly Dinghy Class Association sought ways to make the Seafly more popular. 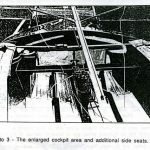 The July 1987 SDCA Newsletter reported that the “possibility of producing a Seafly with an alternative cockpit layout more suitable for the owner who preferes to cruise and perhaps also of interest to sailing schools” be put to the SDCA Annual General Meeting. 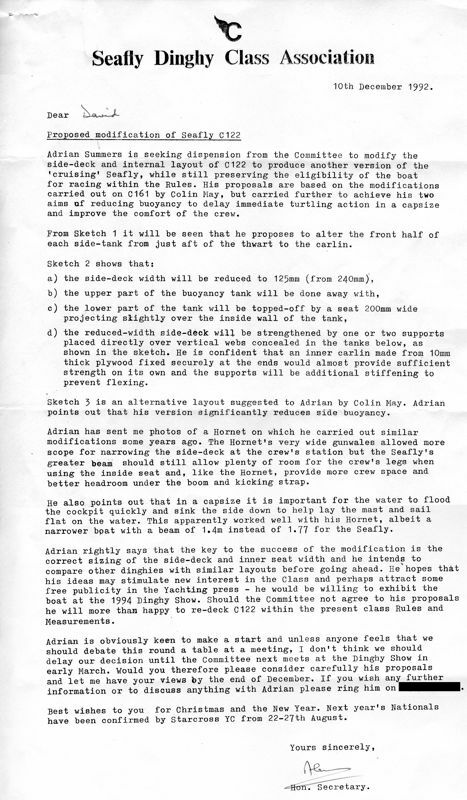 The idea was “to lower the side buoyancy tanks so as to provide additional seating as in the Albacore”. However when Colin May’s suggestions were put to the AGM the members present were not enthusiastic (see below). 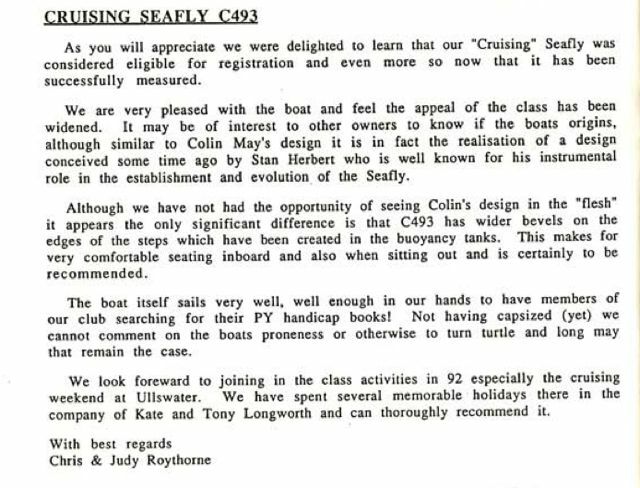 Nevertheless, in May 1989 it was reported that Stan Herbert had re-decked C493 with seats built into the side tanks to give a narrow side deck “for those who want to cruise”. 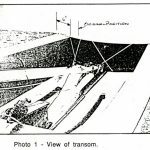 The item was accompanied by the cartoon reprodued above. 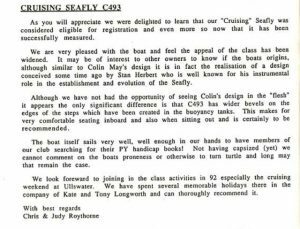 In the Winter 92 Newsletter there was a letter (see below) saying how the then owners of C493 were “delighted to learn that our ‘Cruising’ Seafly was eligible for registration” and that it had been successfully measured. 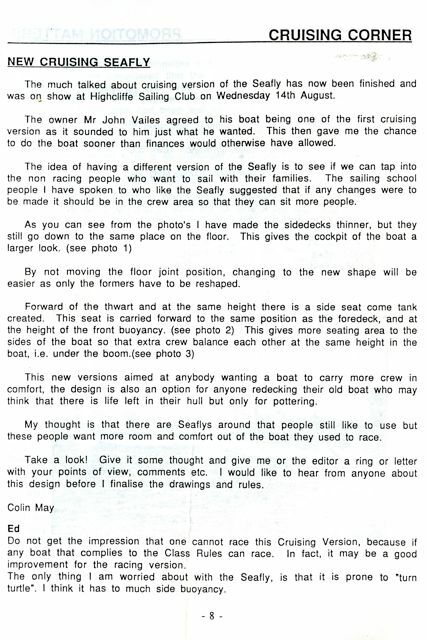 In the Autumn 1991 SDCA Newsletter Colin May described his own conversion of John Vailes Seafly (presumably C161) to an alternative, “cruising” layout . 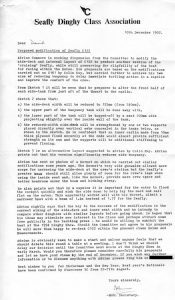 The accompanying photos are not well reproduced in the newsletter (see below). 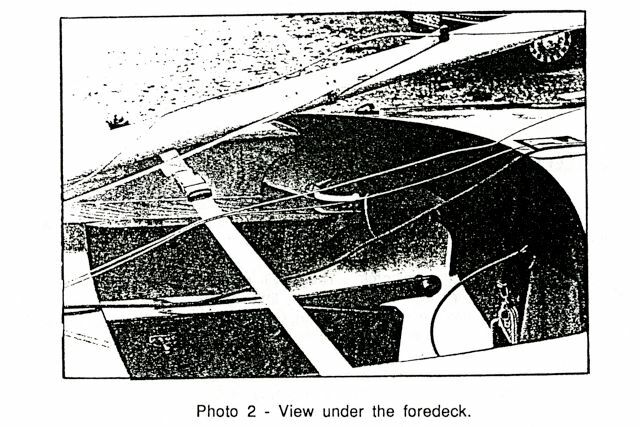 The new layout featured a narrower side tank and side seats forward of the thwart with further buoyancy below. 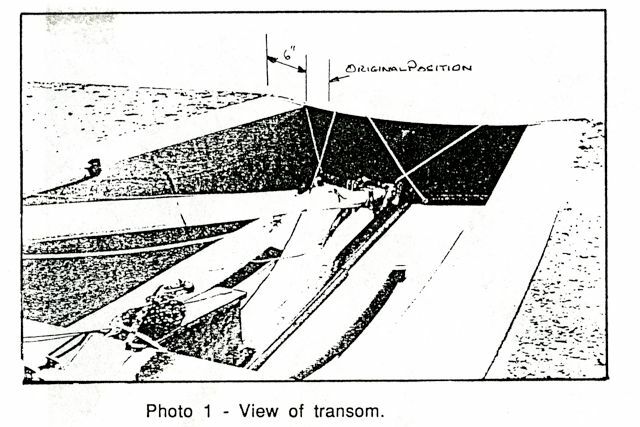 Adrian Summers who, like Colin May, was a previous National Chanpionship winner, did not believe that the May conversion adequately addressed the problem of the Seafly turning turtle during a capsize. 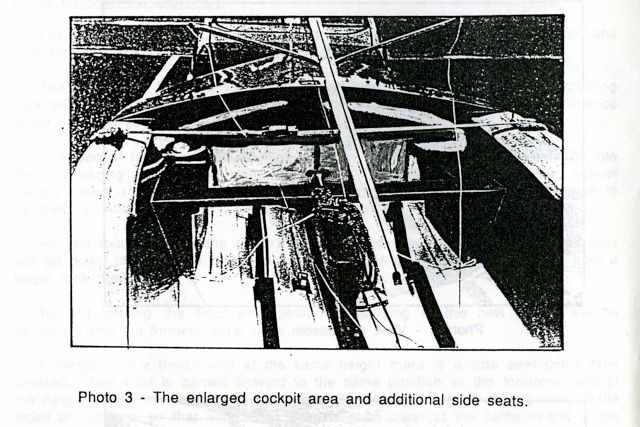 He proposed an alternative cockpit layout which considerably decreased the side buoyancy. 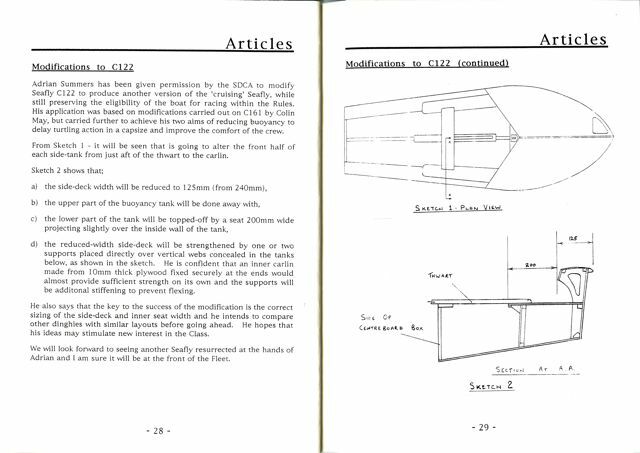 With SDCA approval he converted C122, a boat in which his father had been National Champion in 1967 and 1968, as described in the Winter 1993 newsletter (right). Adrian Summers proceeded to win the National Championship with C122 in at least two further years (1993 and 1996). However it is not known whether any other “Cruising Seafly” was built or converted to either the May or Summers designs. 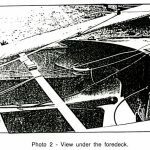 In more recent years the “Modern Seafly” has been available in a “Cruising” version, however this was simply a version of the racing layout. 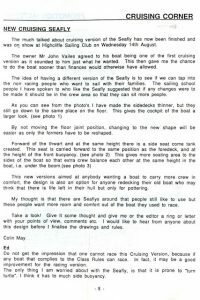 Based on that design, Peter Taylor has assessed the suitability of the Seafly for Dinghy Cruising in an article in the Dinghy Cruising Association magazine.